The Mini-Wrap Shrink Packager is designed to produce a perfect seal with a PTFE-coated bar, not a hot wire. 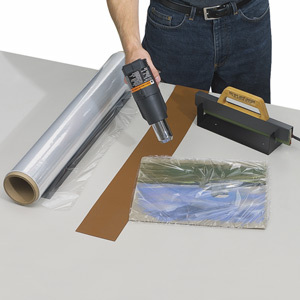 This makes it safer, more reliable, and much less expensive than other shrink packagers. Professionally seals in seconds. This sealer measures 17" long. It requires 115V and 150W. The Milwaukee Heat Gun is included.